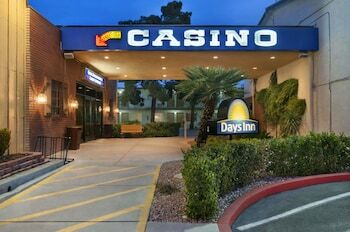 3330 W Tropicana Ave | When you stay at Days Inn by Wyndham Las Vegas Wild Wild West Gambling Hall in Las Vegas, you'll be near the airport, within a 5-minute drive of MGM Grand Casino and Orleans Arena. This casino hotel is 0.8 mi (1.3 km) from Park Theater and 2.2 mi (3.6 km) from High Roller. Make yourself at home in one of the 260 air-conditioned guestrooms. Complimentary wireless Internet access keeps you connected, and cable programming is available for your entertainment. Private bathrooms with shower/tub combinations feature complimentary toiletries and hair dryers. Conveniences include irons/ironing boards and blackout drapes/curtains, and you can also request cribs/infant beds (complimentary). When you stay at Days Inn by Wyndham Las Vegas Wild Wild West Gambling Hall in Las Vegas, you'll be near the airport, within a 5-minute drive of MGM Grand Casino and Orleans Arena. This casino hotel is 0.8 mi (1.3 km) from Park Theater and 2.2 mi (3.6 km) from High Roller. The preferred airport for Days Inn Las Vegas At Wild Wild West Gambling Hall is Las Vegas, NV (LAS-McCarran Intl.) - 3.5 km / 2.2 mi. Head straight for the casino, or wait for that lucky feeling while you enjoy one of the other recreational opportunities, such as an outdoor pool and a spa tub. Additional amenities at this hotel include complimentary wireless Internet access, concierge services, and gift shops/newsstands. You can enjoy a meal at Dennys serving the guests of Days Inn by Wyndham Las Vegas Wild Wild West Gambling Hall, or stop in at the grocery/convenience store. Quench your thirst with your favorite drink at the bar/lounge. Breakfast is available for a fee. Featured amenities include a computer station, complimentary newspapers in the lobby, and dry cleaning/laundry services. Planning an event in Las Vegas? This hotel has 665 square feet (62 square meters) of space consisting of conference space and a meeting room. Free self parking is available onsite. The preferred airport for Days Inn by Wyndham Las Vegas Wild Wild West Gambling Hall is Las Vegas, NV (LAS-McCarran Intl. ).